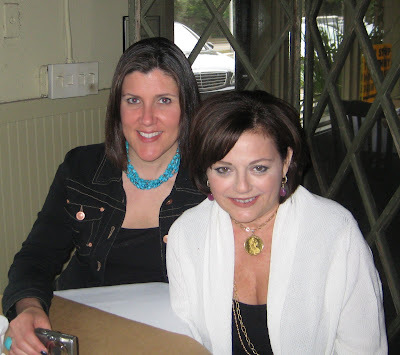 On Saturday, Blogger Cote de Texas welcomed All The Best's Ms. Ronda Carmon to Houston to discuss blogging, design, publishing, and other important topics. The summit meeting, held in Southampton, Houston's Museum District, lasted approximately two hours over lunch. In a sign of solidarity, the two parties both ordered the same dish: crab cakes with chicken noodle soup. Over the course of lunch, it was discovered that the two bloggers share the same politics and the same feelings about the current administration. Whoop!! Following a quick shopping trip to M. Naeve, the two parted, promising to rendezvous at another summit, date to be determined by their social secretaries. At an impromptu press conference held outside M. Naeve, Cote de Texas stated that All The Best was sweet, friendly, very pretty, easy to talk to, warm, and politically - very smart! All The Best is heading back to Scotland soon, while Cote De Texas headed off to an appointed with a client. You are both too cool! Loving it! You make me smile and laugh! Gotta love it! The blogging world gets smaller every day. Glad you had a great time together--sounds like fun! Oh to have been a fly on the wall! And some of your readers share that polical view. Love the museum district! All my favorite bloggers are getting together. Sounds like a Decor G-8 meeting. Love this picture! You guys are too cute!! So nice when you can meet up with "online" friends :) Sounds like a successful Summit meeting.